First Line: He was going to die. that was quite obvious. In 1944, British bomber pilot Hugo Langley was shot down over German-occupied Tuscany and found refuge in a ruined monastery and aid from lovely young Sofia Bartoli. Thirty years later, Hugo's daughter, Joanna, has returned to the English countryside to arrange her father's funeral. In going through his personal effects, she finds an unopened letter addressed to Sofia, and in it is a revelation that sends her to Tuscany. Her journey has a twofold purpose. Not only does she want to learn about her father's experiences during the war, she also needs time to heal from her own personal trauma. However, she soon learns that some would prefer that the past remains in the past. The two timelines of 1944 and 1973 work well in The Tuscan Child, and as I read, I was very pleasantly reminded of other suspense novelists such as Victoria Holt, Mary Stewart, and Kate Morton. Joanna Langley is the type of main character with whom you can easily sympathize: wounded, wary, intelligent, and brave-- and she's willing to learn how to cook. A definite word of warning: if you love Italian food and you're hungry, you will drool when you read segments of this book! Joanna has a lovely little Tuscan hill village to explore that's filled with interesting characters. Many welcome her, but some do not. And that ancient monastery that was ruined by the Germans is holding plenty of secrets all on its own, although with the clues Joanna has, they aren't going to be easy to uncover. Bowen's characterization, pacing, and setting are all first rate (par for the course for this talented woman). She's created a two-pronged mystery, and while one part of the puzzle was rather easy to solve, the second one certainly wasn't and took me by surprise. It shouldn't have because the clues are there, but I was too caught up in the story to pay close attention. 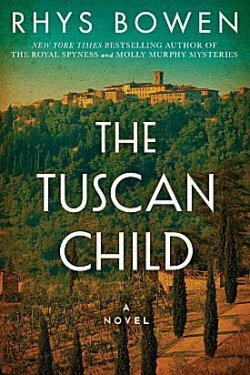 If you like fast-paced stories with dual timelines, intriguing mysteries, and mouth-watering food, let yourself be tempted by The Tuscan Child. This sounds really good, Cathy. And I so admire Bowen's ability to do all sorts of different stories. She has the Evan Evans series, the Molly Murphy series, etc... That takes talent. Yes, it most certainly does! Second review of this book this morning I've read! Thanks. I like this one.